Hulu has done a great thing. It has brought a Sion Sono film right to my computer screen on the same day of its NY premier. The 3/11 context is surely what guided Hulu’s decision to host this new work on the disaster’s 2 year memorial. Though fictional, The Land of Hope deals with a disaster identical to that of the 3/11 earthquake, focusing on the many “fallouts” of the nuclear crisis. The circumstances of The Land Of Hope are thus; an earthquake strikes, a tsunami hits, and the integrity of a nuclear power station is at grave risk. The story, spare on plot points and generous with emotional nuance, concerns the experience of two families, the Shimizu’s and the Ono’s, in the fictional town of Nagashima (a combination of the names Fukushima, Nagasaki, and Hiroshima which are the Japanese cities historically exposed to radiation). The Ono’s are a rustic farming family who own their own land and raise cattle. Father Yasuhiko, ailing mother Chieko, son Yoichi (Kaijima from Heaven’s Story), and the son’s wife Izumi. After the earthquake, an evacuation radius is drawn around the Nagashima power station. The border disaster runs through the middle of the Ono’s property. Though technically in the “safe zone,” the father demands that his son and daughter-in law relocate while Father and Mother remain where they are, sternly refusing to leave their home where they have set their roots and invested their whole hearts. Reluctantly heeding his demand, the newly pregnant couple relocates and is gradually gripped with a phobia of radiation. 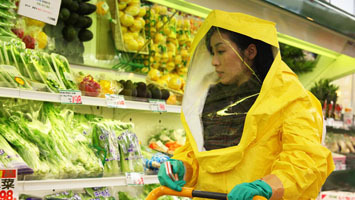 Izumi spends her days in a Hazmat suit to protect their unborn child while Yoichi tries to stave off fear, accept hers, and live a normal workaday life. 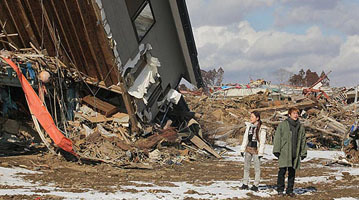 The Shimizu’s, living just one house over, are displaced by the evacuation and go to the local shelter. Their son Mitsuru and his girlfriend Yoko travel to her hometown to find out what has happened to her parents, knowing full well that the Tsunami destroyed the town. They traverse a demolished apocalyptic landscape and Mitsuru does his best to help Yoko through this painful realization. These two stories are analogous because the family structures are the same, and they both explore the idea of “home” and how it can mean different things to different people, whether it be inflexible or fluid. Sono’s main approach with Land Of Hope is discretion. The camera is tame, the scene of the disaster is spared us, and the more interesting thing – it’s effects, on an intimate and patient scale – unfolds as the substance of the narrative. The everydayness that Sono captures is wonderful, which defies “disaster film” expectations, but is a departure from Sono’s characteristic darkness. Sono makes a few comments on the state of his mother country and the national consciousness concerning nuclear power, but is thankfully discreet about these points. He draws no firm conclusions, but outlines a harsh reality and errs on the side of a cautionary mentality. Ultimately Land Of Hope is about overcoming a psychology of fear and a lifestyle of perpetual prevention and protection from the invisible or the impending. In the only country scarred by Nuclear attack, and one so especially prone to earthquakes, that mentality could easily swell into a national characteristic. Sono’s vision however, is one of grounded hope, and aims at dispersing a consciousness of victimhood. It sounds silly to say, but although there is something universal about Land Of Hope, it is so Japanese. By this I mean that there is a palpable urgency (one might mistakenly call it melodrama) underneath the performances that is so characteristic of that nations dramatic arts, and that is foregrounded by the otherwise stillness of the film. The Korean’s call it Han, and they share it too in their cinema and dramatic arts. Han is an emotion that has no simple English equivalent, but is described as a kind of pained sincerity. The simplest explanation is that it is a collective emotion forged by oppression and strife that characterizes all other emotions with greater depth, urgency, and tactility. A kind of Han has always been alive in Japanese cinema. Barring their own native word for such a quality, Sono has tapped the well and rendered a sensitive story of emotional and psychological survival. The Land Of Hope is currently available to watch on Hulu.